Canewdon is a large parish, which extends for several miles along the southern side of the River Crouch. 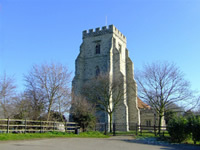 The parish takes its name from King Canute who was victorious in battle over Edmund Ironside in the nearby Crouch Valley (see District Tour - Ashingdon). The remains of entrenchments, said to mark Canute's camp, lie near the parish by the River Crouch. The impressive tower of Canewdon Church is of historical interest. It is said to have been built by Henry V in thanksgiving for his victory at the Battle of Agincourt. The modern day Canewdon offers a wide range of housing, within a close-knit village community. Nearby Wallasea Island is also part of the parish and is a popular centre for sailing and fishing. A bronze age oar dating from about 1000 BC was found in a riverbank and is the earliest example of oars being used in Northern Europe.